Take a peek at the latest innovations in radiology monitors. Some of the biggest advancements in imaging over the past few years have been in display monitors, which have become better, brighter, and faster. Advanced in-plane switching technology has resulted in improved images with darker blacks and better overall contrast; light-emitting diode (LED) backlighting technology has provided more brightness and more margin above target luminance for longer life; and graphics card and graphics processing unit advancements from NVIDIA and AMD, coupled with DisplayPort connectivity, get pixels to the screen faster than ever. The emergence of 4K Ultra HD displays on the consumer market is also driving change in radiology displays. "While some radiologists initially started to use consumer-grade 4K displays, adoption of new medical-grade 4K monitors is now growing," says Garry Wicka, head of marketing for US business solutions at LG Electronics. "And for good reason: In addition to delivering four times the resolution of conventional HD displays, they are designed specifically for superior performance to give radiologists more reading confidence." David Sorensen, director of engineering and research and development for Double Black Imaging Corporation, says another popular topic of discussion is multimodality monitors. "Basically, it is the idea that you have one display that is appropriate for looking at all the modalities that a radiologist might encounter, perhaps within the same study," he says. "A multimodality display is going to be a color display in order to handle the color in images, such as PET or ultrasound, but it also needs to have the brightness, contrast, resolution, and grayscale calibration to properly display grayscale images such as DR, CR, CT, and MRI." One further step to a fully multimodality display would be to include mammography images from full-field digital mammography (FFDM) and digital breast tomosynthesis (DBT). James Lupino, sales and marketing manager for U.S. Electronics Inc, says the main trends he sees are low-cost monitors for home use, increased software solutions focused for enterprise displays, and increased display resolutions from 6 to 12-plus megapixels (MP). "Cloud-based imaging is also a trend which will lead to zero-footprint workstations," he says. "I don't see OLED [organic light emitting diode] screens making an impact anytime soon. Maybe quantum dots in the backlight will produce better colors." Mark Hansen, director of business development for Image Diagnostics, says there has been a shift toward modifying surgical monitors to add the capability of projecting radiology images from C-arms. "Because of the explosion of hybrid rooms, the big radiology companies want more control over the image quality that their million-dollar machine is putting out, so they've requested that manufacturers create surgical displays that would have some of the same general characteristics you would get on a radiology display," he says. "We are moving portable 4K screens into hybrid screens to project primary images on a mobile platform." In the early years of medical display monitors, after it had been established that image interpretation on electronic monitors was equivalent to that of hard copy films, the first monitors were cathode ray tube (CRT) displays. Avneesh Gupta, MD, radiology IT director for Boston Medical Center, notes that, although these CRT monitors are adequate in terms of resolution and brightness, they are bulky and use curved glass displays, which are prone to glare, regardless of viewing angles. "In addition, they are susceptible to degradation of contrast performance over time," Gupta says. "Liquid crystal display (LCD) monitors gradually replaced CRT displays and have generally been favored, due to their smaller footprint, lower power consumption, reduced glare, less degradation of contrast resolution, and longer lifespan." Just as high-bright, high-resolution monochrome CRT displays were replaced by monochrome LCD monitors, monochrome monitors soon gave way to color. "Advances in backlight technology gave yield to high-bright, high-resolution, color LCD displays," Wicka says. "Next, [cold cathode fluorescent lamp] technology was replaced with LED backlight technology. Now, we are seeing widescreen, higher-brightness, higher-resolution monitors with thinner bezels." Some of today's benefits include larger viewing areas, better brightness uniformity, and two bezel-less displays combined into a single widescreen monitor. According to Lynda Domogalla, vice president of product marketing for the health care division at Barco, Inc, today's radiologists often look at images from multiple modalities as part of the patient case review, so displays designed to present color images and moving images, together with grayscale images, can make their reading workflow more efficient. "[Barco's] SteadyColor calibration makes sure that color images are also displayed consistently," Domogalla says. "Our Coronis Uniti display system is designed for multimodality imaging." Gupta utilizes Barco monochrome LCD monitors for the bulk of Boston Medical Center's diagnostic imaging and has been closely following the monitor evolution. "More recently, additional refinements to LCD monitors have been implemented," Gupta says. "For example, color LCD monitors have been used more frequently for cross-sectional imaging studies—which are inherently displayed in grayscale—because the addition of color may help with 3D reconstruction applications and other postprocessing tools, such as those used with multienergy CT."
LG launched its medical imaging devices business in 2016, offering clinical and surgical monitors. "With growing interest in consumer-grade 4K Ultra HD displays, LG created the medical-grade 27HJ712C-W clinical review 27-inch 4K display," Wicka says. "The 27HJ712C-W provides radiologists reading confidence by using an internal backlight sensor to perform closed-loop brightness stabilization and maintain DICOM compliance." And because doctors and clinicians often have to look at displays for a long period of time, which can result in eye fatigue, LG's clinical review monitor includes Flicker Safe and Reader modes, which protect users' eyes from fatigue by reducing flickering to almost zero. In the past year, Double Black Imaging has introduced a new Gemini series of large-format color displays, which include a new 6MP (6G) and 8MP (8G). The 6G is a multimodality color display that can be used for all modalities except for mammography, while the 8G is a multimodality color display that can be used for all modalities including FFDM and DBT. "These large-format displays are like two portrait displays side by side without the bezel in between," Sorensen says. "However, our most popular displays remain the 3MP Color and 5MP Color portrait displays. Users like the ability to 'bookend' a pair of these portrait displays by tilting them slightly inward. The benefit is that all of the display surface remains a similar focal distance to the viewer's eye, which isn't something that can be done with the singular flat, large-format display." Sorensen says 2018 is a great time to buy a radiology display. "LCD display technology combined with LED backlighting has improved and matured, providing excellent-quality images," he says. "Calibration tools facilitate the conformance testing process, and productivity tools help radiologists to do their jobs better with less frustration." Hospitals and imaging centers sometimes wait to upgrade display systems, but with the innovation that has come out in the last couple of years, most experts believe now is the time to do so. "Radiologists should be reading on displays that allow viewing of medical images at their acquired native matrix size to ensure accurate diagnosis," Wicka says. "It's important that DICOM target calibrated brightness is maintained through an internal backlight sensor closed-loop brightness stabilization system." Wicka also notes that replacing consumer-grade displays with medical-grade clinical review monitors improves reading confidence, accuracy, and capability at a comparable price point. The main purpose of clinical review monitors is cross-checking and analyzing patient exams. "Because clinical review monitors decode image information differently than regular monitors, a clinician could see different results from the same test, depending on the monitor's image quality, color expression, and contrast," Wicka says. "This could lead to faulty analysis or treatment, so it's essential that a clinical review monitor is utilized." Domogalla says all radiologists will benefit from these new technologies. "Since their workload and the types of images they read is growing, displays which support multimodality reading, increased detection, and improved ergonomics help them in reading any type of images," she says. "And, specifically for radiologists who read breast images, there is a growing need to bring together 2D mammography, DBT, breast ultrasound, and breast MR images, as it takes multiple imaging techniques to diagnose dense breasts." Still, Gupta notes that display monitors cost approximately $25,000 or more per set, so, realistically, most practices would not upgrade their monitors before the display's end of life. Another consideration when it comes to monitors is the radiologist. Sorensen notes that reading room ergonomics should be considered to improve efficiency, comfort, and radiologist health. "Several factors need to be considered: display size, resolution, viewing angles and optimizing luminance levels to reduce eye strain, and new productivity tools [that] are designed to improve efficiency and workflow," he says. "Ergonomic workstations have been found to enhance productivity and increase blood flow while lowering the risk of cognitive decline." Gupta says factors beyond the display itself, such as ergonomics, contribute to the overall image viewing experience, and they merit attention when discussing imaging displays. "Ergonomic enhancements have gained increasing importance as radiologists have become prone to developing eye strain and fatigue resulting from increasing imaging volume," Gupta says. "Enhancements such as standing desktops and height-adjustable chairs that allow proper viewing angles have become common techniques to optimize display viewing." Computer-aided diagnosis programs may also help to reduce eye strain and fatigue by highlighting subtle findings via software algorithms; they are currently in use in breast imaging and virtual colonoscopy. The medical display industry is already seeing an expansion of quality and regulatory standards for medical displays all over the world, and this goes beyond DICOM. "There is the EUREF standard in Europe; JESRA in Japan; DIN in Germany; [the American Association of Physicists in Medicine], the ACR, [the Society for Imaging Informatics in Medicine], and The Joint Commission in the United States; [the Advanced Medical Technology Association] in Latin America; [the Mammography Quality Standards Act program] for facilities that do mammography imaging; and now even standards in specific states like New York," Domogalla says. "With these growing, changing, and more rigorous standards, assuring compliance is complicated and requires more time. There will also be a standard for calibration of color on medical displays, like the [grayscale standard display function] for calibrating grayscale." Incremental refinements to the existing display technology are expected to further improve the image display experience for radiologists in the years ahead. For example, OLED displays, commonly found on modern smartphones, may eventually replace LCD monitors and provide better contrast. Color LCD monitors will likely become more commonplace as well. "Furthermore, it is conceivable that the entire imaging display workflow may undergo a paradigm shift away from the current reliance on 2D grayscale monitors, potentially incorporating augmented and virtual reality, broader use of artificial intelligence [AI] tools, and possibly even head-mounted viewing displays," Gupta says. Wicka says adapting OLED technology into radiology displays in the years ahead will provide even higher contrast ratio, wider color gamut, and faster pixel response time than conventional LCD technology. Ultimately, these attributes will be especially beneficial for reading DBT. "While there is lots of buzz in radiology about AI and the potential for machine learning algorithms to perform interpretation and diagnosis of medical images, the reality is that radiologists will be keeping their eyes focused on images displayed on diagnostic quality monitors for years and years to come," Sorensen says. 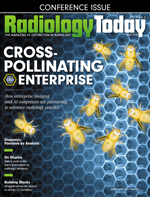 "Expect diagnostic display vendors to continue to innovate and provide the functions and features necessary to bring the highest-quality images in front of the radiologist."